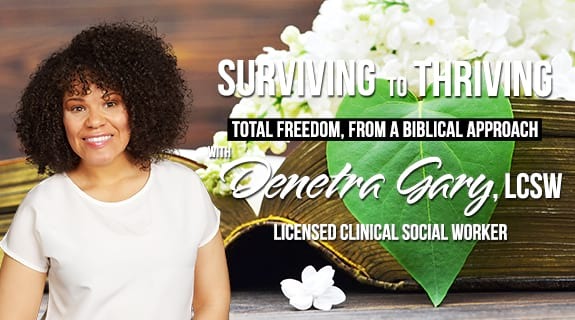 April 25th was the launch of Surviving to Thriving – Total Freedom from a Biblical Approach. The topic for the first episode was Healing from Trauma and Childhood Pain. I was so excited to present my first guest, Carol Zarska. Carol is a counselor, author and speaker. She desires to help individuals to prepare to meet God and connect with Him on a deeper level. She has over forty years experience helping people to resolve emotional hurt and pain. Carol spent the hour first talking about her background and what led to her developing the perspective of healing from emotional root pain. The perspective was greatly inspired by the Holy Spirits leading her to adopt a two year old boy. Who would’ve thought that adopting a child would lead to this profound outlook. She then took us on a journey of understanding where trauma and childhood pain comes from, and further explained the process of emotional roots, and how they started in heaven before the Earth was created. She then explained that a life trial led her to the awareness that she needed to heal from her response to the abuse of her father. We often blame the accuser for all of our hurt and pain without acknowledging that we are responsible for our response and reaction to the hurt inflicted upon us. Having to stop and think about why you do what you do can produce doubt and frustration, especially if you’re searching within yourself for the answer. But the solution to healing from emotional roots is Jesus. Healing from emotional roots goes beyond giving Jesus our heart. We can easily give Jesus our heart without giving him our mind. Our motive may be for Him to change us without the full understanding that this also takes our full cooperation. One would think it would be difficult to walk away from this episode without doing some introspection. The understanding that we all struggle with deep roots that cause negative emotions is thought provoking. I myself have followed the practical guidance of Carol and the outcome has significantly changed my perspective as I’ve healed from the deep emotional pain of my past. The process of this journey is an emotionally painful one. One is in a sense uncovering the veil, and who knows what’s underneath. The glory in working with Jesus through this process is that He does know exactly what is under the viel and he can identify exactly what it is and where it comes from. Carol clarified that it takes us having to walk through the hurt and pain of our past with Jesus in order to mentally heal. He replaces those negative thoughts, feelings and emotions that we developed as a result of the trauma with His thoughts feelings and emotions. We also learned that in order to act like Jesus we must know how Jesus acted. The bible gives a clear illustration on the life of Jesus. When we study the bible we can learn the true character of Christ. My prayer is that this segment will guide us to start the process of allowing Jesus to heal the old wounds, pain, and hurt that dictates our present actions and reactions. It is only when we allow the divine healer to guide us in this process that we can truly be mentally free. So what are the steps to heal from trauma and childhood pain? Read and study the life of Jesus to get an understanding of His character. Acknowledge and ask Jesus to help you identify with the hurt and pain of your past. Give Jesus the permission to walk you through the pain so that you can fully heal. Identify those negative emotions that keep you stuck. Do you feel angry, frustrated, irritated, agitated, anxious or depressed? The list of struggles goes on and on. We all struggle with something. What do you struggle with that keeps you from focusing on Jesus? You can find more information on Carol Zarska at www.mountainrefugeministries.com or you can listen to you her sermons here.